The soles are a thick lightweight Vibram wedge which cushions every step and makes you feel like you are walking on clouds. I suspect these aren’t as hardy as normal Vibram boot soles and will probably wear out faster – my heels are already wearing down on one side due to my terrible gait. The “FO” stands for flesh out, also known as roughout. This is basically full grain leather that is used inside out so that the smooth side of the leather is on the inside of the shoe and the rough side is on the outside. This type of material is commonly used in military boots because it is full grain so it is very hardy. The rough side is on the outside so there’s no polishing required and the surface is less susceptible to abrasion. Also the rough surface is very good at holding onto waterproofing, which soldiers used to goop on to keep water out and trench foot at bay. I decided to take a page from the history books and waterproofed mine using Huberd’s boot grease which is a mix of beeswax and coal tar. This darkened the leather and made it more matte and less suede-like in appearance. Over time, the nap stood up again and the contrast of the dark and light really gives it a nice patinated look which you don’t normally get with suede. 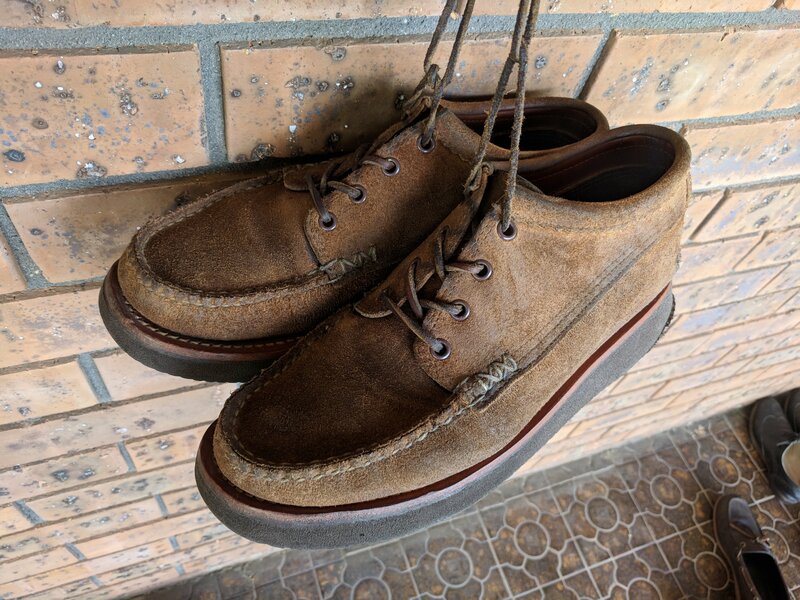 Because of the appearance and applications, roughout boots or shoes are definitely casual and my Yuketens wear almost like sneakers. I wear mine with denim, chinos, fatigues, or corduroys. It’s a bit quirky and different to what you see on most people’s feet (even in the Instagram menswear world) and I get a lot of compliments and comments when I wear them (which is often! ).